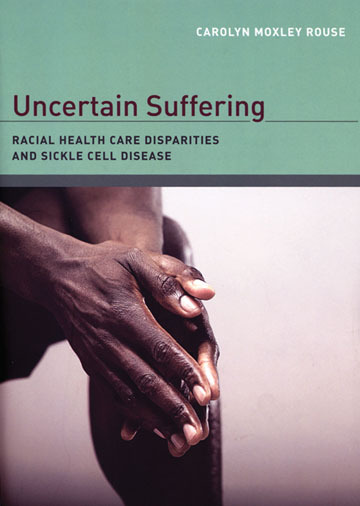 With good reason, one should hesitate before describing an ethnography about those with an incurable disease—and the broken health care system that attempts to treat them—as “wonderful,” but such is the elegant scholarship of Carolyn Moxely Rouse on the topic of sickle cell, a disease that disproportionately affects African Americans in the United States. Uncertain Suffering is an ethnography—the study of a people. Most of us assume that “a people” are bound together by geographic space or tradition, filial or religious ties. The people of Rouse’s study are bound by their association with sickle cell disease (SCD), whether they have the disease, are related to persons that have it, or treat it. In this study of SCD culture, we learn how people with the disease cope with pain, how they are treated by others, how and why pain is occasionally uncoupled from suffering, what specifically is and is not working for them in the health care system, and how a vulnerable but unpitied group outside of hospital walls is treated when they meet up with the supposedly objective and evidence-based protocols to treat their disease found within hospital walls. 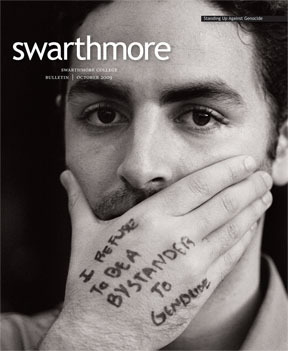 Rouse—like the best students I have had at Swarthmore—attempts to accomplish two dozen things at once. She describes the disease, the social location of those who suffer from it, the responses from the professionals who treat them, and how treatment differs when the racial makeup of a treatment center’s professional staff differs. She uses social theory to interrogate taken-for-granted medical concepts such as “evidence-based” and “objective;” offers rich observations and nuanced quotations from her interviewees; and posits recommendations for social philosophers, the federal government, and the SCD community. Precisely because Rouse accomplishes so much in this book, it will have its detractors. Let me anticipate their complaints. The book often reads like a weighty conversation in which quite a bit of background knowledge is assumed. As someone who’s done the background reading, it was a pleasure. That said, I want Uncertain Suffering to be read by policy wonks, physicians, nurses, and nonprofit directors—and it’s pretty dense for a wide audience. Still, it’s crucial reading for anyone in the helping professions. Rouse also takes for granted the intelligence, humor, and insight of the mostly poor, all black, mostly adolescent patients that she got to know during the course of this study. By taking their point of view as a starting point, she treats those at the margins as if they were at the center—reversing, upending, and overturning the paradigms in which we’ve been trained. Rouse comes to learn, she says, that helping patients manage pain is the subject of much disagreement. SCD centers that have majority black staffs have a different approach than those with majority white staffs, but the differing approaches do not correlate with her initial expectations. Increasing quality of life is not necessarily a conclusion that can be reached via statistical analysis—and quality of life, rather than pain eradication only, she learns, informs the approaches of SCD clinics with majority black professional staffs. For all of us struggling to understand how discourses of rationality, fairness, and compassion respectively could lead us to the Iraq War, the response to Hurricane Katrina, or the health care reform debacle, Rouse offers some complicated answers. She reminds us that too often we live with competing contradictions while simultaneously forfeiting power to professionals whose prose confounds us. And when we’re the professionals, we’ve often taken our own professional baptism without remaining suspicious of our socialization and without continuing to question the art and science into which we’ve been socialized. 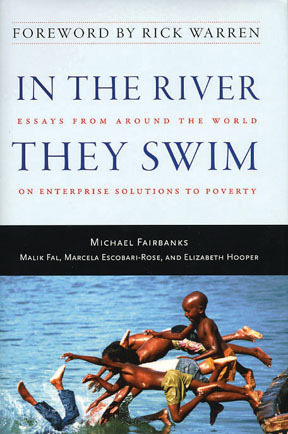 Michael Fairbanks, Marcela Escobari-Rose ’96, Malik Fal, and Elizabeth Hooper (editors), In the River They Swim: Essays from Around the World on Enterprise Solutions to Poverty, Templeton Press, 2009. This collection gathers a unique mix of participants who reflect on their experiences portraying the struggle to close the global development and poverty gap. The foreword is by evangelist Rick Warren. 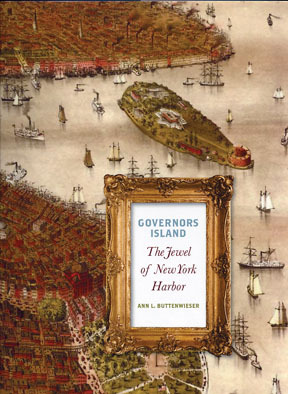 Ann Buttenwieser ’57, Governor’s Island: The Jewel of New York Harbor, Syracuse University Press, 2009. Using never-before–published photographs, blueprints, architectural plans, and interviews with former residents, the author—an urban planner and waterfront historian—creates a striking portrait of the island. The future of Governor’s Island, which is owned by New York City, is the subject of much debate. Rio Akasaka ’09, A History of the Swarthmore Fire Company, lulu.com, 2009. Compiled while the author—a passionate young firefighter with a close attachment to the Borough of Swarthmore—was an undergraduate, this work uses rare pictures, anecdotes, and detailed stories to depict the company’s history. Jane Jaquette ’64 (editor), Feminist Agendas and Democracy in Latin America, Duke University Press, 2009. This collection examines the response of Latin American women to the dramatic political, economic, and social changes of the last 20 years. Meredith Anne Skura ’65, Tudor Autobiography: Listening for Inwardness, The University of Chicago Press, 2008. 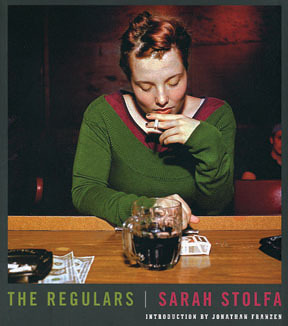 Showing that a writer’s thoughts and feelings can be traced in his or her language, Skura offers a glimpse into a range of lived and imagined experiences that challenge assumptions about life and autobiography in the early modern period. Abbott Small ’67 D, Into the Turquoise: Poems, Dennis Small, 2009. Through images of Nature, fused with human needs, hungers, fears, and joys, this poet of faith transcends the Judaic and Catholic avenues of his spiritual pilgrimage to attain insight into both the terrors and rewards of our common human heritage. Cécile Whiting ’80, Pop L.A.: Art and the City in the 1960s, University of California Press, 2006. This award-winning work offers an in-depth examination of Los Angeles as a focus of and inspiration for art, photography, painting, and sculpture. Victor Piñeiro Escoriaza ’00, Second Skin, Liberation Entertainment Inc., 2009. 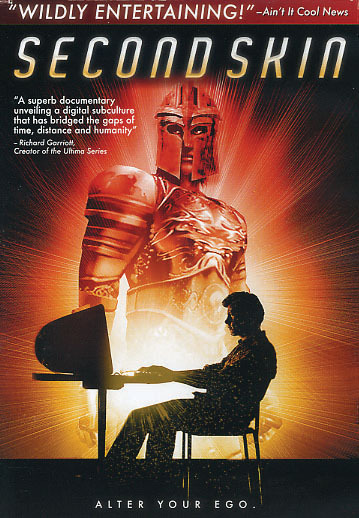 This film takes a fascinating look at computer gamers whose lives have been transformed by the genre of games that allow millions of users worldwide to interact simultaneously in virtual spaces. Bennett Lorber ’64 joined with three other painters to show some new paintings, including little gee 4, in an exhibit titled 4 Artists—New Work in the Muse Gallery in Olde City, Philadelphia, during the month of August. 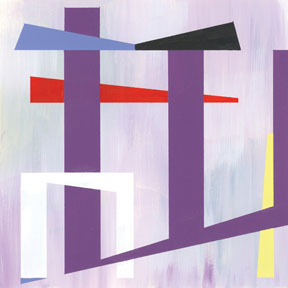 Lorber, the Thomas M. Durant Professor of Medicine and Professor of Microbiology and Immunology at Temple University School of Medicine and Hospital, is one of two physicians who exhibited works in the show. 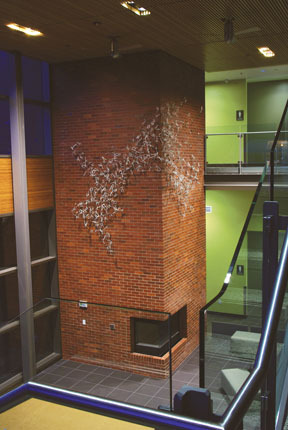 Abigail Donovan ’92 completed a large-scale permanent sculptural installation for the University of Oregon’s new HEDCO College of Education building. A public commission for the state of Oregon, the piece is titled The Cloud of Disquiet: Stanza Second.